American Sign Language (ASL) is now a recognized language and is even being taught on college campuses to fulfill language requirements. And no wonder there are more employers than ever that are hiring people who can sign. It shows good faith and compliance with the American Disability Act and it makes it possible for them to tap into a whole demographic of people they may not have had access to before. Television stations are using sign language in much of their advertising. Schools are hiring more teachers that can sign as hearing impaired students are being mainstreamed through the educational system. Hearing impediment may present its challenges but we certainly would not want to miss out on someone’s talents and gifts only because they are hearing impaired. Learn to express the alphabet, 200 common names and most of the most common words in a short period of time. This software will teach you over 1500 words. Learn to introduce yourself, ask for assistance and just about everything you need whether you are deaf or need to communicate with someone who is. Type in any word and a video pops up showing you exactly what the sign is for that word. 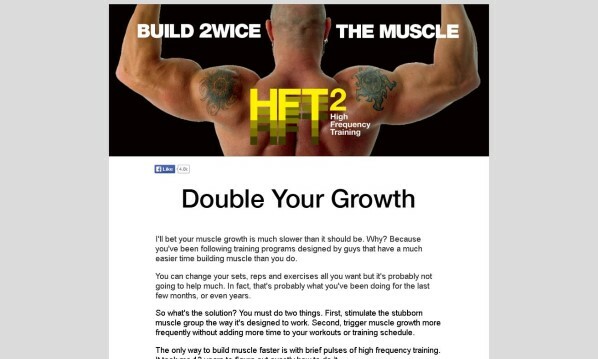 This learning guide is over 30 pages of extra information to supplement what you are learning. It is embedded with video, discusses the history of American Sign Language and even discusses etiquette in the deaf community. This forum just may be the most valuable feature of this course for it allows you to communicate with other members that can assist you when you are stuck on a particular point or sign. This course is thorough, self-paced and makes learning a quick and easy way to learn for any age. The videos are great and allow you to even play at half speed making it even easier to learn. Performance is tracked and you will know every step of the way how you are doing. This course is great. It isn’t just an introductory course. It serves the beginner all the way through to the most advanced student. 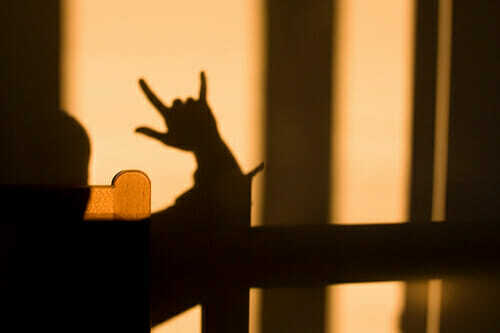 Even if you have no background in sign language the Rocket American Sign Language is for you. It can be used by children as well as adults. 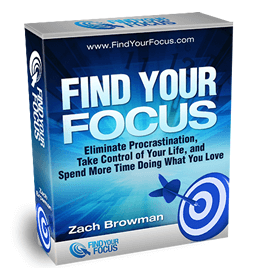 It is great for corporate learning or home school. It can be purchased as a download which cuts the cost of this course in half or if you wish the complete course is available on CD and DVD. Do you want to learn American Sign Language (ASL) within a short period of time? If your answer is yes, then you should consider buying the Rocket American Sign Language. This amazing system will teach you how to communicate using this language. It does not matter whether you are a beginner or advanced language user. When you buy this system, you will learn all the rules of the language whether you are a beginner or an advanced user. The system has been written in simple and plain language that you will not need any instructor to take you through the system. But first let me explain the benefits of ASL and culture that you are missing if you cannot speak the American Sign Language. Why should you learn this important language? Language the American Sign Language has numerous benefits. There is a growing popularity of American Sign Language in the world. ASL is the 4th most studied modern and foreign language at colleges and universities in the U.S. You too should be part of this statistics. The use of ASL can promote the bilingualism which can boost your brain development. Knowing more than one language is a great booster for brain development. 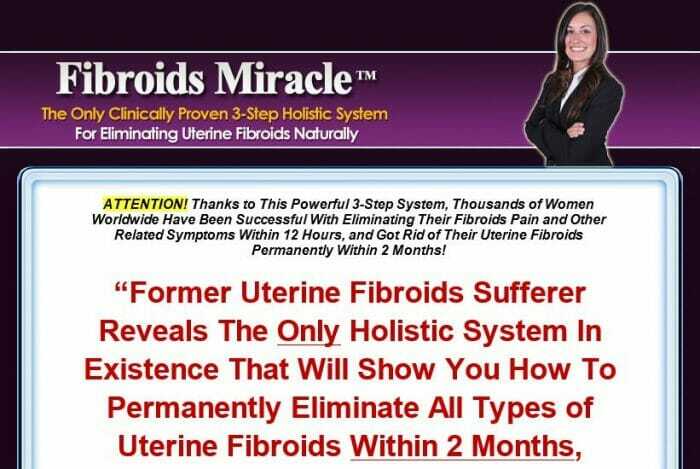 It will enrich you and enhance your cognitive processes. The use of ASL can promote the communication with deaf babies. You can use the ASL to communicate with deaf babies. The use of ASL can promote communication with animals. The use of ASL will enable you to communicate with animals. So, if you are a tourist or an international relations expert, you cannot avoid the American Sign Language. It is one of those languages that are in high demand. But, which programme can give you all the information– about the ASL that includes cultures and all aspects of American sign speaking? You may say that there are numerous programmes on ASL and culture systems. I know of so many systems on ASL that have been written. 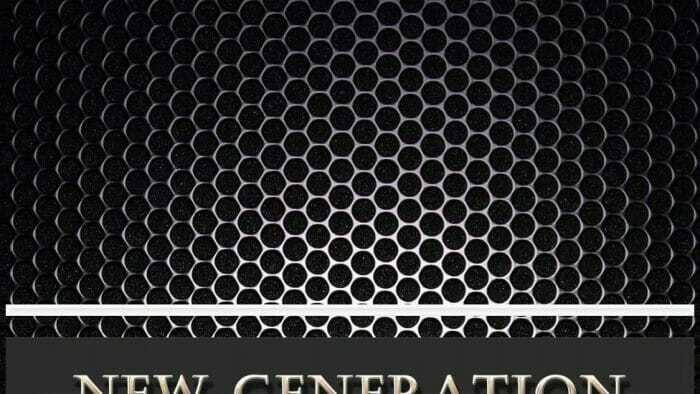 But when you look at the content and structure of these systems, you will be disappointed. This is because most people who claim to be American Sign speakers are not the Native Americans. They are just ghost writers who claim to understand the ASL but with limited knowledge in American Sign speaking. I have only known one system that gives you all the information about ASL and culture systems- the Rocket American Sign Language. This is the only system that you will find that will teach you holistically on how to communicate using the ASL. You will find a lot of information trial lessons that you can use for practise purposes. Even if you are a beginner, you will begin to like and love these lessons because of the practicals contained in the programme. It contains a lot of information on American Sign culture. When you buy this amazing system, you will learn all the information that pertains to understanding of Arab culture in more details. You will improve your communication skills with the American Sign cultures. It contains the Interactive audio lessons and the language and culture lessons. These give you a balanced approach to learning each language on use of American Sign Language. It contains the lots of features that help you with your learning. These include adding notes on lessons, earning points, saving words in the vocabulary, and practicing your pronunciation with Rocket Record which is a voice comparison technology. It contains a track record within your online member’s area and it rates lessons using the online system. This programme is the only complete programme that you will find over the internet that will teach you holistically on how to communicate using the ASL. Even if you are a beginner, you will begin to like and love these lessons because of the practicals contained in the programme. “Ever thought about learning something new? Rocket American Languages is the best to start learning a language which you thought might be difficult to study! You’ll be impressed how it is in fact easy to talk. An awesome part of this language program is the ability to hear the French speaker, record yourself speaking French and hearing both simultaneously. Also like the mp3 ability to record lessons. I love the combination of listening, speaking, reading, and writing. Being able to interact with the same words and phrases many times, and in many different ways, helps increase my familiarity and my retention of the words. My confidence has skyrocketed, and I truly believe I will be able to communicate when I travel to China. Knowing how to use sign language in English is very crucial because it is the universal language and by using it fluently puts you to advantage among others. However, not all of us know how to do sign language using the English language because it is not their native language. This gives people a sort of hardship because they are not acquainted in using the said language. 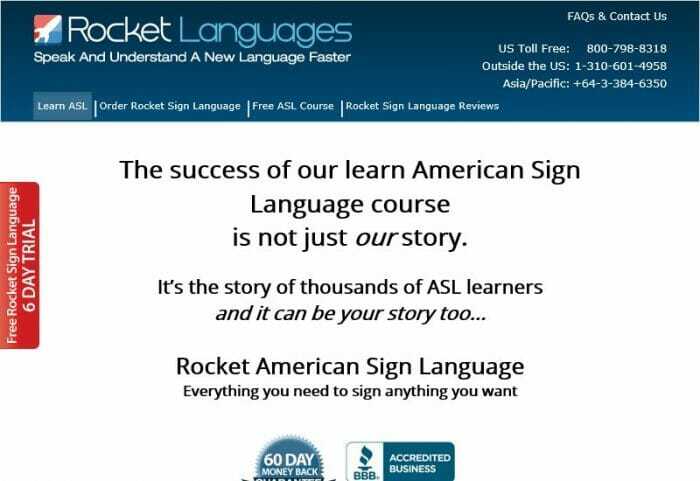 Thankfully, this product which is called “Rocket American Sign Language” has been created that is aimed to teach people how to use American Sign Language properly. This product will let you build strong fundamentals in the English Sign Language which will let you use the language over time. You will build a lot of self-esteem in conversing with people. By learning the English Sign Language and using it fluently it will open up a lot of opportunities for you. 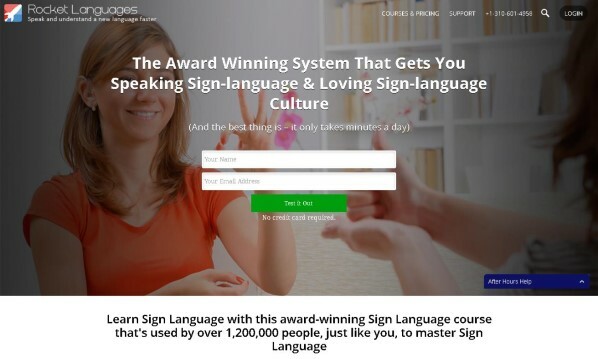 So if you want to increase your English Sign Language proficiency or you are just starting out to learn the English Sign Language this product is the perfect one for you. Buy this product and you will surely never regret your decision. This is probably the best product that you can give yourself as a gift! Thanks for Reading This Rocket American Sign Language Review.